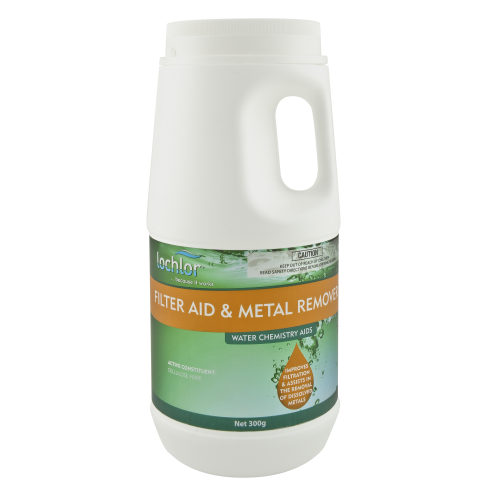 Lo-Chlor Filter Aid & Metal Remover is a fast acting filter aid clarifier to remove dissolved metals, dead algae and other suspended matter from pool water. Lo-Chlor Filter Aid & Metal Remover is a dual acting product that works within your sand, cartridge or DE filter. • Lo-Chlor Filter Aid & Metal Remover spreads a coagulant over the sand to stop small particles passing through the media and returning to the pool. Lo-Chlor Filter Aid & Metal Remover is also ionically charged to attract the negatively charged debris again, preventing it from returning to the pool. • When used with Lo-Chlor Metal Solution, this product aids in the removal of metals such as copper, iron and manganese that would otherwise cause pool surface staining or water discolouration.